These Gombey dancers from Bermuda were in East Falmouth on Saturday to reconnect with the Mashpee Wampanoag, a Cape Cod Native American tribe that the Bermudians consider long-lost family. Gombey dancers from Bermuda were in East Falmouth on Saturday to reconnect with the Mashpee Wampanoag, a Cape Cod Native American tribe that the Bermudians consider long-lost family. 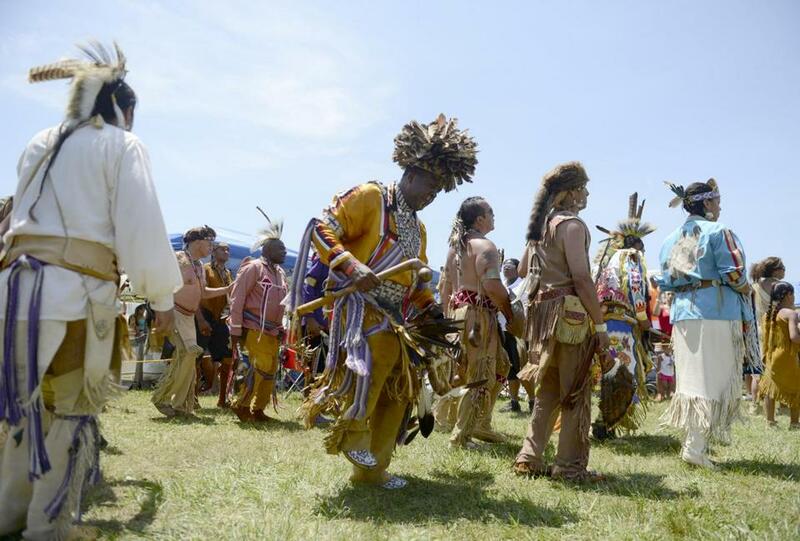 The latest reunion took place at the Mashpee Wampanoag Pow-Wow, an annual, weekend-long celebration of native culture in its 92d year. The event, which drew hundreds of attendees despite the sweltering heat, featured drum and dance competitions, dozens of vendors plying traditional jewelry and clothing, and even a falconer. The latest reunion took place at the Mashpee Wampanoag Pow-Wow, an annual, weekend-long celebration of native culture in its 92d year. The event, which drew hundreds of attendees despite the sweltering heat, featured drum and dance competitions, dozens of vendors plying traditional jewelry and clothing, and even a falconer. Traditional dances were the only pieces of Wampanoag culture to survive centuries of slavery and cultural repression in Bermuda, Filice said, and even those traditions were drastically altered as they mixed with the cultures of other slaves. But the Bermudian group is beginning to reclaim its heritage. Filice lamented that the connection to Native American groups is little known in Bermuda, where African and Caribbean ancestry is more commonly recognized. “Part of our community’s mission is to teach Bermudians our whole history,” she said. While Pow-Wows have roots in a traditional Wampanoag homecoming ceremony for members of the tribe who had moved away, the modern Pow-Wow borrows its format from Wild Bill-style rodeos popular in the early 1900s, according to David Weeden, this year’s Pow-Wow director. Saturday’s festivities began with an early morning canoe race, but the day kicked into high gear at noon, when dozens of dancers made their way into the circle at the center of the fairgrounds, keeping time with the steady drumbeat and marking the accents with their movements. Respect for elders was a prominent theme at the Pow-Wow and remains a central tenet of Wampanoag culture. US Representative William R. Keating, whose district includes Mashpee, made an appearance at the event and lauded the cooperation between his office and leaders of the Wampanoag Tribe, which has federal recognition. Bear Bear Laughing, who is half-Mohawk and half-Navajo, traveled here with her family from New York to attend their third Mashpee Pow-Wow. The family takes time off in the summer to visit Pow-Wows in Massachusetts, New York, Connecticut, and Canada. The children earn their keep by helping make crafts or winning prize money in dance competitions. Though she is not Wampanoag, many of the rituals and dances here are familiar, Laughing said. “A lot of us [Native Americans] actually believe the same things, we just celebrate them differently,” she said, adjusting the metal noisemakers on her daughter’s dress. Pow-Wows offer an important chance to pass on cultural traditions that would otherwise fade, she said. 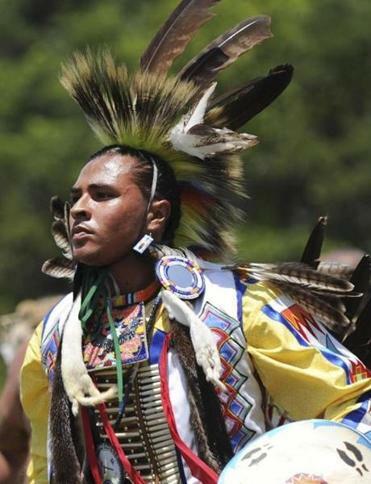 For many Mashpee Wampanoag, the annual Pow-Wow is the scene of solemn spiritual rituals. One such ritual is Fire Ball, when men kick and carry a flaming ball, sustaining burns as a sacrifice to bring good medicine to their families and ancestors. “I’ll be playing for my son and his daughter,” said Robert “Quiet Storm” Robinson, a retired Marine and Vietnam veteran who said his son had died of diabetes. Robinson said the Pow-Wow is the highlight of his year. “Wherever I am, I always come home for my Pow-Wow,” he said, describing how he once took leave from the Marines while stationed in the Philippines to make it back for the celebration.